To send the ball where you want it to goal, whether to another player or into the goal, you need to strike the ball with just the right amount of force and with the correct part of your foot. 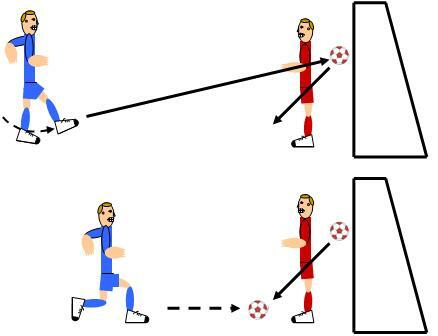 To kick the ball with force, plant your non-kicking foot next to the ball and swing your foot through the ball. This follow through is critical to getting the full force of you foot transferred to the ball. Kicking the ball above the center will keep the ball moving on the ground. To get the ball to move off of the ground, kick it below the centerline of the ball. 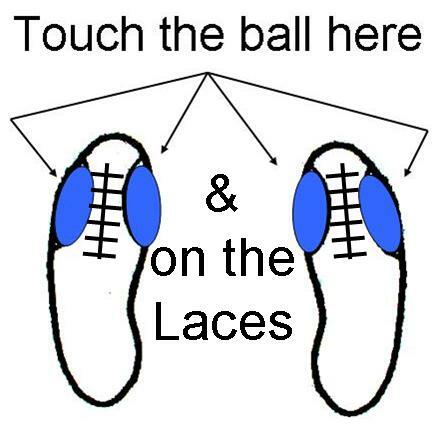 The point of contact for a long, lofted pass or a shot on goal should be the laces of your shoe. -follow through with your toes going through the ball towards the palm of your opposite hand. For shots on goal, follow every shot and quickly move in after it. Assume that you are going to miss and be there to kick in the rebound. The ball might go in the goal or it might rebound from the posts, other players, the goalie, or even the referee. Follow through on every shot. Do not stand still and watch the ball – chase after it! If the Goalkeeper is standing in the center of the goal, shoot for one of the corners. If the Goalkeeper is gaurding one side of the goal, shoot for the other side of the goal.